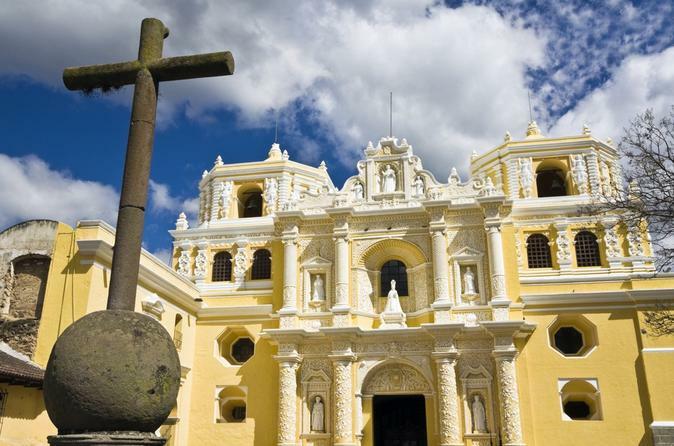 See Guatemala’s mixture of Mayan and Spanish influences on this 8-hour tour from Guatemala City to the Iximché ruins and the city of Antigua. Learn about Mayan history from your expert guide as you explore the archeological site of Iximché. Then, move on to the Spanish colonial city of Antigua, where you’ll see some of its most famous sites, including San Francisco Church, Calle del Arco, La Merced Church and Plaza Central. This historical day trip is perfect for the whole family! Discover the beauty and history of Guatemala on this full-day historical tour of the Mayan ruins of Iximché and the colonial city of Antigua. After pickup from your Guatemala City hotel, venture northwest approximately an hour to the dusty town of Tecpán, the location of the Mayan ruins of Iximché. With your knowledgeable guide, explore these ruins, which were once the site of the Kaqchiquel Maya capital. When you enter the site, you'll see four ceremonial plazas surrounded by tall temple structures and two ball courts. The plazas were used for things such as housing and special ceremonies, and the ball courts were used to play the Mesoamerican ballgame, a sport that dates back to 1400 BC. As you walk around, your guide will provide historical commentary. Spend about two hours at Iximché, and then be driven to the city of Antigua, about an hour away. Have lunch at a local restaurant (own expense), and then visit the Central Plaza with your guide. Here, visit San Francisco Church, home to the shrine of Peter of St Joseph Betancur. Explore the ruins of the Santo Domingo Monastery, which was once the largest and wealthiest monastery in Antigua. And admire the arch of Santa Catalina, one of Antigua's most recognizable landmarks; built in the 17th century, the building connected to the arch was once home to Santa Catalina Convent. Next, visit the beautiful and Baroque-style La Merced Church before entering the Museo del Jade (Jade Museum), where you can witness craftsmen making unique jewels out of stones and see an impressive jade collection. You’ll then be taken back to Guatemala City.